Writing for the AAP's Council on Sports Medicine and Fitness, William P. Meehan, III, Director of The Micheli Center for Sports Injury Prevention at Boston Children's Hospital, MomsTEAM concussion expert emeritus , and featured in MomsTEAM's PBS documentary, The Smartest Team: Making High School Football Safer , and Gregory Landry, a professor specializing in pediatric and adolescent primary care sports medicine at the University of Wisconsin School of Medicine and Public Health, recognized that head and neck injuries in football have been a topic of "intense interest recently in both the public media and the medical literature." 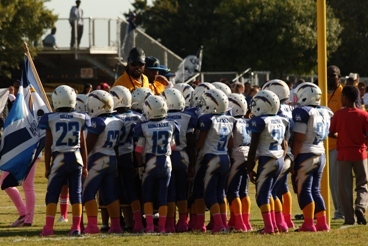 They acknowledged that safety concerns - especially about the risk of concussions and catastrophic injuries - have led to a drop in football participation, while recognizing that the potential for adverse long-term health consequences from multiple concussions and repeated subconcussive blows to the head  had prompted calls for limits on the number of full-contact practices, a delay in the age in which tackling is introduced, and even for an outright ban on football at below college. As for the risk in tackle football of second impact syndrome , the statement said that, while often associated with football, it has been observed in other sports such as ice hockey, boxing, and skiing. Given its rarity, its incidence in football was, said the group, unknown. 1. Strictly enforce rules against spearing. A signiﬁcant number of concussions and catastrophic injuries occur because of improper and illegal contact, such as spear tackling. The AAP statement bemoaned what it said was a "culture of tolerance" of head ﬁrst, illegal hits, and called for a change in that culture to one of "zero tolerance" emphasizing protecting the heads of the tackler and players being tackled. The statement calls for consideration of "stronger sanctions" for contact to the head, especially of a defenseless player, up to and including expulsion from the game. 5. Consider delay the age at which tackling is introduced. Doing so, said the authors, would likely decrease the risk of injuries for the age levels at which tackling would be prohibited, but, once introduced, might expose athletes with no previous experience with tackling to collisions for the ﬁrst time at an age at which speeds are faster, collision forces are greater, and injury risk is higher. Because such lack of experience with tackling and being tackled may lead to an increase in the number and severity of injuries once tackling is introduced, the AAP said that if rules banning tackling below a certain age were adopted, "they must be accompanied by coaches offering instruction in proper tackling technique as well as the teaching of the skills necessary to evade tackles and absorb being tackled." 6. Promote neck strengthening. Although recognizing that "deﬁnitive scientiﬁc evidence is lacking," the AAP endorsed strengthening of the cervical musculature as a way of reducing the risk of concussions in football by limiting the acceleration of the head after impact. Physical therapists , athletic trainers, or strength and conditioning specialists, with expertise in the strengthening and conditioning of pediatric athletes, are best qualiﬁed to help young football players achieve the neck strength that will help prevent injuries. 7. Staff games and practices with athletic trainers. Given their importance in the medical management of sport-related injuries and preliminary evidence suggesting an association between athletic trainers presence and a decreased incidence of sport-related injuries, efforts should be made by football teams to have athletic trainers at the sidelines during organized football games and practices . Annual pre-participation physical evaluations (PPE) for every athlete, including a concussion baseline evaluation and screening for high-risk kids (e.g. those with history of multiple concussions , ADD, learning disability , etc. For a pdf of the full AAP policy statement, click here .